So here's the thing: this is a cheesecake, but it is no ordinary cheese cake. I want you to imagine a heavy, dense New York style cheesecake, the kind that sits like paste on your tongue. Now, I want you to forget everything you know about that cheesecake. Instead imagine a cheesecake unlike anything you've ever had---imagine a thick, buttery graham cracker crust topped with the fluffiest, lightest cheesecake ever. Imagine eating sweet, rich clouds of cheesecake---lemony, sun-drenched clouds. Now you are beginning to understand Milnot cheesecake. So, what exactly is Milnot? Good question. I realized, as I was making this cake for the first time on my own, that I had absolutely no idea what Milnot was. As a child, all I knew is that it was very special and it tasted delicious in this cake. And that's really all you need to know. (For those of you who are curious, I did a little research. Milnot is evaporated milk with the animal fat removed and replaced with vegetable oil. Originally this shelf-stable "filled milk" was useful--and inexpensive to produce--before there refrigeration became widely available.) The really interesting thing about Milnot, though, is that it whips up like whipping cream when you beat it with an electric mixer. Whipped Milnot is the key ingredient in this fluffy-soft cake. The only problem is that Milnot is hard to find. (That is why this cake is so special!) The Milnot Company, which produces this canned miracle milk, is based in Ohio and is now owned by Smuckers. For some reason, Milnot is not widely available on the West Coast. 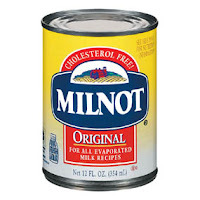 When I was growing up, my mom resorted to having relatives from Chicago and Ohio import as many cans of Milnot as they were willing to carry. I randomly found cans--two for a dollar!--at a Grocery Outlet near my house, so I snapped them up to make this cake. If you come across some Milnot, I suggest you do the same. (You can also order it online!) Your idea of cheesecake will change forever. Dissolve Jell-o in boiling water and chill in the refrigerator until slightly thickened, about 20 minutes. Meanwhile, cream the cream cheese, sugar and vanilla in a large bowl. Set aside. Melt butter and stir into graham cracker crumbs, mixing until completely combined. Press crumbs into an 13x9 inch baking pan. Set aside. Beat the chilled Jell-o into the cream cheese mixture until completely combined and smooth. In a large bowl, whip the chilled Milnot until it forms soft peaks. Fold the whipped Milnot into the cream cheese mixture. Pour Milnot filling evenly onto the graham cracker crust. Refrigerate for 8 hours. *Note- Serve this cake cold. Top with more graham cracker crumbs and fresh fruit. Yesterday was one of my coworker Nancy's last day of work, and in her usual form, she brought in several trays of baked goods to share with us all. What a sweetheart. One of the treats were these amazingly tasty cheesecake bars. I usually am not a huge fan of cheesecake (because there isn't enough chocolate) but these mix the best of both worlds: cheesecake and chocolate chip cookies. Enough said. Pre-heat oven to 325 degrees. Butter a 9x11 baking pan. Whip up a batch of your favorite chocolate chip cookie dough (I recommend Martha Stewart's Chocolate Chip Cookie recipe from her "Cookies" book, or the back of the Nestle Tollhouse bag). Press a little more than half of the cookie dough into the bottom of the baking pan evenly with a rubber/silicone spatula. Set aside remaining batter. In a bowl whip together sugar and cream until light and fluffy. Add eggs and vanilla and cream until mixed well. Pour on top of cookie layer in baking pan. With the remaining cookie dough batter, press handfuls of batter flat in your palms, then drop on top of cream cheese mixture in the pan. Repeat until evenly distributed across the top. Bake at 325 degrees for about 45-60 minutes until toothpick inserted comes out clean and cookie dough is golden on top. Let cool then slice into bars. I am inspired and reminded by Alexis' New Tuna Salad Sandwich Recipe post. I personally love egg salad sandwiches slightly better than tuna salad, but that may be due to the fact I always have eggs lying around, and never tuna. They make a great lunch to bring to work as well. As Alexis indicated, there are several ways not to make a tuna or egg salad sandwich, with a very fine line separating good from bad. I consider a not so tasty egg salad sandwich to look like a heap of yellow mayonnaise looking mush between two pieces of white bread. It gives me shivers just thinking about it. A great egg salad sandwich would look very much like one they serve at The Bagelry Co-op in Santa Cruz. The key is to treat your hard boiled egg whites separate from the yolks, and add a very tasty ingredients to spice it up. Egg salad is great between to pieces of toasted wheat-style bread, or toasted bagels. Yum. Begin by setting your eggs out so they come close to room temperature, or run them under warm water to bring their temp. down. The less cold they are when they go into the hot pot, the less likely they will crack. Bring a small pot of water to boil. Place the eggs gently in the pot and bring it to a simmer. Simmer on low for 10-12 minutes. Immediately put the eggs in an ice bath to cool them off. This will ensure they are easy to peel. Peel your eggs and put the yolks in one small bowl, and the whites on a cutting board. Chop your whites coarsely, to about 1/4"-1/2". Add the mustard and mayo/yogurt to your yolks and mix until fluffy. Add in the rest of your ingredients, except for the egg whites, and mix well. Gently fold in your chopped egg whites. Toast a bagel or bread, and enjoy your egg salad! There's your typical tuna sandwich, and then there's this tuna sandwich. We're really going to blow your mind with this one. Well, I mean it's only a tuna sandwich, but just think: whole grain mustard! Curry paste! Hummus! Greek yogurt? Feta? Yes, yes, yes, yes and yes. This here is a bit of a tuna sandwich revolution. Best get ready. So, my mom never made tuna sandwiches for me when I was little. She didn't like canned foods. Or mayonnaise. I specifically remember having one or two tuna sandwiches as a kid, eaten tentatively like a foreign food while at a friend's house. I kinda liked them. Still, something about tuna is a just little funky. Tuna sandwiches sure taste good, but they'll never be cool. Tuna just smells a little too fishy to be hip. Like many recipes, tuna salad preparation requires constant tasting and adjusting. Wait for it.... You'll know when you've gotten it just right. Trust me. Mix well tuna and all subsequent ingredients in a medium bowl. Lightly toast your bread and spread all four slices with hummus. Divide tuna salad evenly between two slices. Sprinkle each sandwich with feta, top with lettuce and remaining bread slices. Prepare to be blown away. *More, or less to taste. As you can see, this is not an exact science. Do whatever tastes good to you!